The latest initiative to streamline Medicare costs and boost the quality of care is nearing its debut. Many of the issues facing the healthcare system relate to controlling costs while improving quality. Enter accountable care organizations (ACOs), coordinated systems of collaboration designed to closely connect groups of providers willing to take responsibility for improving overall health status, care efficiency, and the experiences of a defined patient population. According to Mansoor Khan, ScD, CEO of DiagnosisOne, the current trajectory of Medicare costs is unsustainable and will eventually cause major upheavals in American society if left unchecked. To try to redress the situation, Congress has embraced the concept of value-based purchasing and enacted it into law through the Affordable Care Act of 2010. As Khan explains, the act contains several provisions with the goal of improving quality and placing Medicare on firmer footing. “The methods are to expand value-based purchasing, broaden quality reporting, improve the level of performance feedback, create incentives to improve quality, improve beneficiary outcomes, and increase the value of care,” he says. Value-based purchasing links payment directly to the quality of care provided. The concept is that under these provisions, providers of Medicare services will continue to receive traditional fee-for-service payments but will also be eligible for additional payments based on meeting specified quality and savings requirements. According to Ken Perez, who directs MedeAnalytics’ healthcare policy research and serves as senior vice president of marketing, there are two types of ACOs: Medicare ACOs, which will be framed by the Shared Savings Program, and commercial ACOs, in which a commercial payer provides financial incentives for quality and cost performance. Think of ACOs as mini managed care plans in the Medicare fee-for-service payment world, meaning all participating providers would continue to bill Medicare individually. “However, the ACO would coordinate reducing costs and improving quality so that a year or two out, when the Centers for Medicare & Medicaid Services [CMS] reconciles the costs of the members, participating physicians and hospitals would share in any savings,” Kottoor says. The CMS hasn’t launched a formal program to promote the establishment of ACOs, in part because the agency was focused on drafting the proposed regulations that were issued March 31. Wes Champion, senior vice president of Premier Consulting Solutions, expects the CMS Innovation Center to initiate additional pilot programs that may test new payment models and care delivery systems based on accountable care principles. “These are positive first steps toward overcoming fragmentation in healthcare and will allow doctors and hospitals to work cooperatively to improve quality, reduce costs, and enhance the care experience,” Champion says. Given the delay in publishing the proposed rule, Champion says organizations will have to understand the requirements and evaluate their participation in a matter of months to meet CMS deadlines. “This is a significant task, as the rule is vast, addressing critical issues such as shared savings payments, beneficiary attribution, participation requirements, claims and other data exchange, quality and efficiency measures for assessing ACO performance, and more,” Champion says. The only drawback, according to Kottoor, is ACOs’ mixed track record. “Success is really tied to how integrated the ACO is in the first place, how committed the participant providers are to the goals of reduced costs and improved quality, and how active they are in tracking patients from a clinical standpoint,” he says. A sound technical infrastructure for clinical integration must be established. As Kottoor explains, most doctors’ offices do not yet have an EMR, and they are not yet fully committed to technology as a means of tracking patients and intervening in their care. “That needs to be overcome or, over the long-term, the savings and quality won’t be there,” he says. What is the best way to lay the groundwork for a successful ACO? • be patient centered and have the CDS systems to provide patients with individualized care plans. • Does the provider have the appropriate culture to move forward? • Do physicians and midlevel providers work well together? • Is the leadership, both clinical and administrative, committed to being accountable on quality and cost? • Does the provider have the appropriate IT infrastructure to collect and submit quality and cost data to the CMS? • Are there sufficient IT professionals capable of analyzing clinical data to ascertain care gaps and redesign clinical processes? • Does the financing make sense? • Can inpatient admissions and emergency department visits be reduced without financial repercussions? “Ultimately, if you’re not willing to commit to ensuring a high level of operational and clinical effectiveness and integration, you don’t belong in the business of an ACO,” Kottoor says. The costs of creating ACOs will depend in large part on the IT infrastructure selected by the ACO to implement the clinical and administrative processes required. A key goal of ACOs is to drive continuous improvements in the quality of care, an area where HIT figures to play a large role. 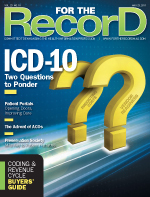 “ACOs will need to create seamless processes that provide real-time, evidence-based guidance to care providers—whether they be in an inpatient environment, an ambulatory environment, or a home care environment—measure outcomes, compare outcomes against desired goals, and then modify the evidence-based guidelines as needed to further improve outcomes,” Khan says. To accomplish this, ACOs must carefully select an IT system that will be at the heart of its efforts to generate savings. But as Kottoor points out, the problem is that unless they own a managed care plan, most primary care physician associations and hospitals don’t have the administrative or clinical IT infrastructure necessary to facilitate that kind of information sharing. They will need to find cost-effective solutions that can be deployed quickly to close that technical gap. Kottoor says many organizations contemplating becoming ACOs don’t fully understand HIT’s impact on their success, in part because hospitals and physicians have primarily been providing care while health plans have been paying for that care. Up until now, the entities have been completely separate. Perhaps most importantly, Champion says there are many unknowns in the ACO world. How will payments be divided among doctors, specialists, nurses, and others providing care? What financial benefits will flow to patients? How should ACOs be organized and led? How fast can ACOs be implemented given the cultural, financial, and operating changes required? As Anil Kottoor, president and CEO of MedHOK, explains, in many ways the clinical integration that accountable care organizations (ACOs) must achieve is similar to the task facing regional healthcare information organizations (RHIOs) and the Nationwide Health Information Network (NHIN) initiative. In effect, a properly run ACO will create its own captive health information exchange, whereby everything a healthcare organization needs to know about a patient from a clinical and an administrative standpoint can be shared between ACO staff and the hospital. Through the download of fee-for-service data and other information, ACOs hope to create a complete clinical profile of each member, which is also the goal of RHIOs and the NHIN.